Whether you're throwing downwind or into a moderate headwind, the Surge will deliver maximum distance while still remaining highly controllable. 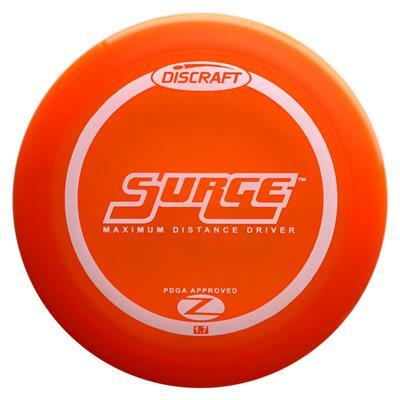 What makes the Surge especially hot is the extra glide you'll get throw after throw. It's the first release in our ESP line, which delivers both durability and outstanding grip like none other. You'll feel the difference immediately. This is a go-to reliable driver. It has the stability to handle power and headwinds. Very controllable driver that can help you stay in the fairway when accuracy really counts. This is my favorite go-to driver. Great for forehand and backhand shots off the tee. Its stable so you can put a lot of power behind it. Very consistent flight. This disc is great when you wanna get max distance but want control. I throw this when i wanna throw my crank but dont want as much left to right movement. If i need more control with that consistent distance! This is the disc to do so!